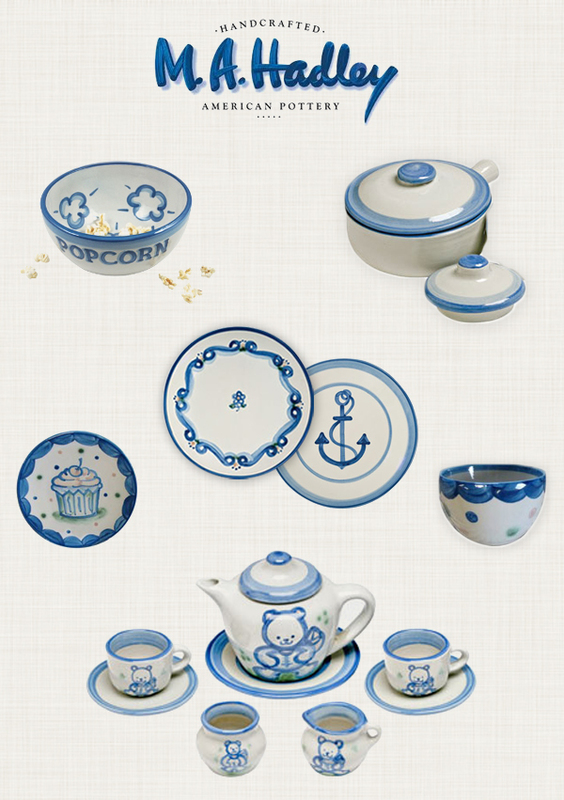 Hadley Pottery is a Kentucky-based company that has been making pottery since 1940. Although the original founder, Mary Alice Hadley, passed away in 1965, the creative inspiration that she brought to the wares still lives today. The pottery is still made using the same techniques and artistic vision that began with Mary Alice. The pieces are made by hand (see the process here), in Kentucky, with local clay, and are full of tradition and Southern charm. They are made in America, with american resources, using traditional techniques: they're a piece of american history. The bowls, plates, pitchers, platters, mugs, drawer pulls and almost everything else you can think of (they even have pet items!) are all chip resistant, dishwasher, oven, and microwave safe, and all bear a vibrant blue color- their signature color. They come in many fun patterns and styles, ranging from traditional designs to nautical themes to country scenes and much more, and would make a lovely gift to treasure for generations to come. See all pattern here or shop by item here. I know a little girl that would be euphoric to receive that little teddy bear tea set! I love this post! My grandma recently passed away and I inherited her Hadley pottery collection. Every time I get to the bottom of my coffee cup and see the sweet words "the end" I smile and remember her. I have a very modern home and the Hadley pottery still looks fabulous! Thanks for the sweet post, love it!